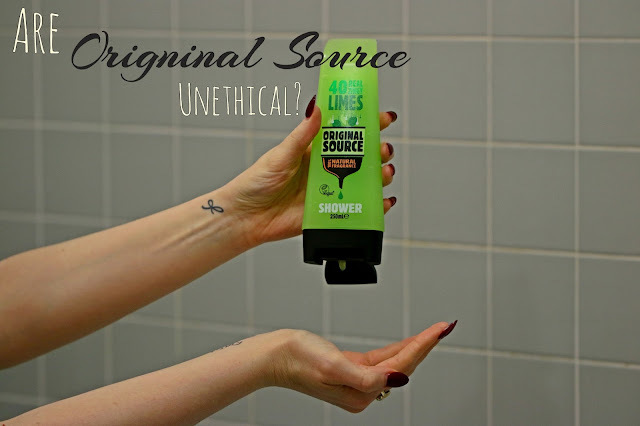 Michelle Louise Love: Are Original Source unethical? A couple of months ago I did a post about transitioning to cruelty free cosmetics and wrote about how much I like Original Source shower gels. They are clearly labelled as vegan and come in a huge amount of fragrances suitable for men and women so they seemed to me like a good choice, however someone posted a comment saying they are unethical because they use micro plastics in their products. Micro plastics quite often come in the form of those annoying little plastic balls you'll find in your cosmetics that claim to exfoliate but really do nothing other than fill our oceans with little bits of plastic that marine life ingest and often die of as a result. I haven't personally bought any of the exfoliating gels from Original Source but was surprised by the accusation that a company that labels its products as vegan would use micro plastics, so I decided to look into it. Original Source are labelled as vegan which means we can rest assured that they do not test on animals and contain no animal products, the exfoliating versions of their shower gels use natural elements for their abrasive qualities such as fine nut shell. Original Source contain 100% natural fragrance and scrubs, so there are no micro plastics lurking in their products. I looked into the ethical rating of the brand and found they actually are rated pretty well, they mostly lose marks for the failings of their parent company Cussons which is quite sad. Under the umbrella of an ethical company they would rate very highly. But nether the less Original Source are still a fabulous cruelty free brand and have values that align with my own so I will continue buying their shower gels and supporting them. I hope this post has cleared up any worries you may have had about these products and given you faith to get behind this brand.